It’s an effort that is expected to raise millions of dollars for the full-service environmental, demolition and mold remediation company, creating potentially thousands of jobs across the country. And even better for Zephyrhills, CES also plans to move the core of its operations from nearby Crystal Springs right into the city’s growing downtown district. The company plans to open offices in the upper floors of the former Wachovia Bank building on the corner of Fifth Avenue and Seventh Street, right in the heart of proposed road upgrades by the Florida Department of Transportation. “This gives the chance for local people who know the company to actually enjoy the fruits of it going public,” said Jeff Chartier, president of Strategic Capital Markets of North Miami Beach, who is now a member of the CES board of directors. “They have a chance to own part of the company, and join us as we’re poised to go on the bigger market,” like the Nasdaq exchange. Chartier presented the new public company to an audience of potential investors last week at Manolo’s Ristorante Italiano in Zephyrhills. There, Chartier offered shares at $1 each — as long as buyers were ready to gobble them up in blocks of 15,000. Traditionally, companies would hit the stock market through an initial public offering, similar to what Twitter did earlier this month when it closed on its first day at $44.90 a share, and raising $31 billion. Taking that approach is very expensive and time-consuming, and could take longer than the year CES needed to go public. Instead, CES took a different approach, called a reverse merger. It found a public shell company — basically a company with no remaining assets — and purchased it. It’s similar to buying a house. The infrastructure is already there for electricity, water and cable, just as the shell company had everything in place to operate as a public company. Chartier discovered CES nearly by accident. While he’s always looking for businesses that could potentially be good public company candidates, Chartier said he didn’t even have CES on his radar until he met owner Al Biston. When he finally did, Chartier liked what he saw. “There’s 140 years of experience with management alone,” Chartier said. “We feel that a lot of institutional funds will be very attracted to this company,” thus potentially boosting the stock price in the near future. Becoming a public company is a completely new world for CES, which has operated 35 years doing business in private, starting originally as Cross Environmental Services. Now everything from its financial records to major personnel changes are part of the public record through the SEC, necessary so investors have a complete picture before buying in. According to its initial filings, CES has a little more than 140 employees, had revenue of $6.8 million over the last six months — generating a loss of a little more than $363,000 — but the company also has a backlog of projects worth more than $9 million. Its clients include federal agencies like NASA, the U.S. Army Corps of Engineers and the U.S. Air Force, as well as industrial and commercial companies like Publix, Cemex, and Jones Lang LaSalle. Local governments that work with CES include the University of South Florida and the Florida Department of Transportation. This same time last year, CES turned a profit of $1.3 million on revenue of $9.7 million. Money raised through this stock offering will fuel expansion for CES, primarily in the acquisition of other smaller companies like it around the country, to help broaden its client base. Although the jobs created through that growth will be outside Pasco and Hillsborough counties, the success will filter its way back into the area —especially for local investors if the stock value rises, as Chartier expects. Biston and two other business partners purchased the former Wachovia Bank building on Fifth Avenue in 2009 for $550,000. They later offered the building to the city for $855,000 as a possible new library before council members decided to expand the library at its current site. Biston told The Laker/Lutz News that he had bought out his other partners on the building recently, and is now the sole owner. He plans to use the upper floors, and lease out the bottom floor for a storefront business, possibly an eatery. “He’s a one-man show. He is economic development, and obviously a very successful man,” City Councilman Kenneth Compton said of Biston. 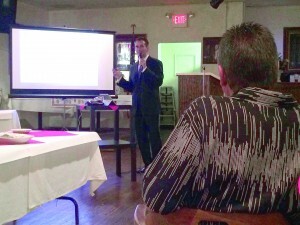 Compton was at the presentation Thursday night with fellow councilman Charlie Proctor.